Today, from the virtual pile of monsters that enterprising and creative designers submitted, our judges provide you with the fifth finalist, untouched by the colorful pen of an editor. 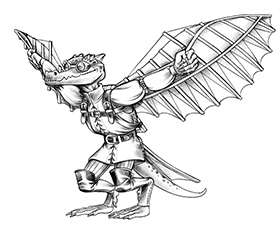 Welcome to the fifth finalist in the fifth monster contest that Kobold Press has run. Take a peek at the skein witch from Sersa Victory. Curators of destiny and enforcers of what must be, skein witches voyage across the planes, weaving the strands of fate at the behest of their goddess-creator. Though they carry out their charge without regard to petty mortal concerns, they can be persuaded to bend fate in the favor of powerful petitioners whose interests align with their goddess’s. A skein witch appears as an androgynous humanoid mummified in writhing diamond thread. Their skin is translucent, and one sees suspended inside their bodies not organs, but rather dozens of quivering hourglasses. Despite their profound supernatural abilities, a skein witch’s physical body is relatively frail – as such, they tend to surround themselves with undead, constructs, or other brutish, soulless guardians cut free from the thread of fate. If the Deck of Many Things is brought within 30 feet of a skein witch, the skein witch emits a psychic wail before discorporating. Bend Fate (1/day). If the skein witch fails a saving throw, it may choose to succeed instead, and one creature within 30 feet of the skein witch suffers the effect that would have been caused by the failed save. Sealed Destiny (1/day). When the skein witch rolls initiative, it attunes itself to the threads of the PCs’ fates. Pass each player a notecard. On it, ask them to write the name of the PC to their left, along with their prediction on how that PC will die (choose one of the options below), and at what level. The players should not reveal their predictions; instead, the DM should collect them. When a PC dies, reveal the prediction – if they died in the manner specified, they fulfilled their true destiny and are immediately resurrected by the gods as a reward. If they died at or within one level of that which was predicted, they return to life with some useful insight into the destiny of someone exceptionally important. Multiattack. The skein witch can use Bind Fates. It then makes two Inexorable Thread attacks or a single Destiny Distortion Wave attack, if able. Inexorable Threads. Melee Weapon Attack: +8 to hit, reach 30 ft., one target. Hit: 22 (3d6 + 12) radiant damage, and the target is treated as if they had just failed a death saving throw. Bind Fates. Choose one PC within 60 feet of the skein witch whose fate it has not already bound. The target must make a DC 18 Wisdom saving throw. On a failed save, the target’s fate is bound to one random ally until either gains a level. Any damage or conditions the target suffers is inflicted on the individual to which they are bound, and vice versa. This bond may have other dramatically interesting effects. Destiny Distortion Wave (Recharge 5-6). The skein witch projects a 60-foot cone of distortion that frays the strands of fate. Two PCs in the cone, determined randomly, swap conditions suffered and number of death saving throws failed. Additionally, living creatures in the cone must make a DC 21 Wisdom saving throw or take 55 (10d6 + 20) force damage. Miss: Half (27) damage. 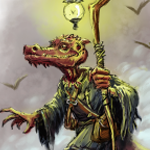 Thanks to the Kobold judges for selecting my monster as one of the finalists. Best of luck to all the monsters! I have enjoyed all the finalists so far, but the Skein Witch with its Sealed Destiny power is pulling ahead in the race as I see it. What a great concept! I love the blending of myth and the honest to goodness witchery powers. Well done and good luck, I proceed to the polls.